I was diagnosed with a missed miscarriage on January 22. It's been 7 weeks since my D&C surgery to remove our little lost bean. The Doctors told me after my surgery that my menstrual cycle would go back to normal shortly. When I asked exactly how long the response was...oh definitely before 6 weeks. So here we are 7 weeks later. What did I expect, my body is anything BUT normal. However I'll save that story for another day. 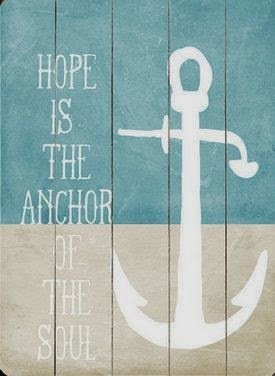 For now, hope is my anchor.